Save on Consoles at Imperare Platform. Top brands include Nintendo. & Nintendo. Hurry! Limited time offers. Offers valid only while supplies last. 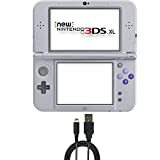 Nintendo 3DS XL Bundle (2 Items): Nintendo New 3DS XL - Super NES Edition and USB Sync Charge USB Cable for New 2DS XL/ New 3DS/ New 3DS XL/ 2DS/ 3DS XL/ 3DS/ DSi XL/ DSi. View more products in Nintendo 3DS.